Something on what I bought on a trip to NIA and what was offered to me at Trichy ….. Lonavla is a town and a hill station Municipal Council in Pune- about 64 km away from Pune, 96 km away from Mumbai. It is a major rail station in that line ~ more famous for that sweet candy locally known as ‘chikki’ …. ‘lonavla chikki’ to be precise…. Once you roam in the streets of Lonavla, there could be so many shops - Maganlal, Rupam, Navratna, Mahavir, Vaishali, Mangal, Panchratna, - and more – confusion apart, people say, everything tastes good and special. Chikki is the traditional ready-to-eat Indian sweet generally made from groundnuts and jaggery. 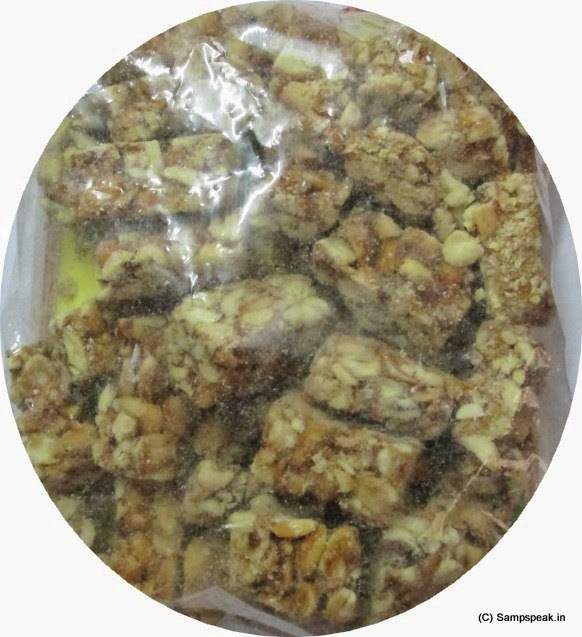 Though there are several different varieties, the most common is groundnut chikki. Read that in regions of North India, especially Uttar Pradesh and Bihar, this sweet is called Layyiya Patti, and also popular in Brazil, where it is known as pé-de-moleque, and in Paraguay, where it is called Ka'í Ladrillo. Those in US and who have people in US know ‘peanut butter’ ….which is a food paste made primarily from ground dry roasted peanut and is popular in North America, the Netherlands, the United Kingdom, Australia and parts of Asia. It is mainly used as a sandwich spread, sometimes in combination with other spreads such as jam, chocolate, vegetables or cheese. The United States is a leading exporter of peanut butter. Nuts are also prepared comparably as nut butters. Groundnut is too common … eaten roasted, boiled in salt water and even raw. The scientific name of common groundnut is - Arachis hypogaea, a species in the legume or "bean" family (Fabaceae). Cultivated in India, (in Gujarat and in Tamilnadu too) – the leaves are opposite, pinnate with four leaflets (two opposite pairs; no terminal leaflet); Groundnuts are a rich source of protein and edible oils and add nitrogen into the soil and can be grown in poor soils. The monounsaturated and polyunsaturated fats found in groundnuts keep the heart healthy. They high protein should be regularly incorporated in diet for children, vegetarians and protein deficient people. 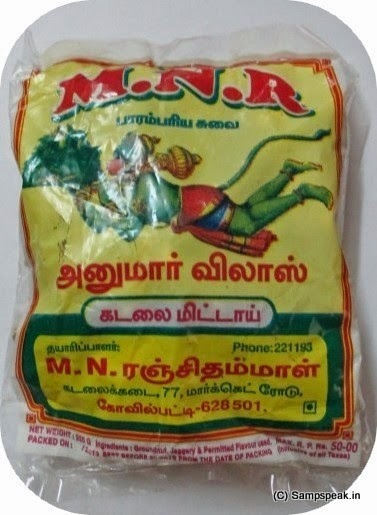 A few months ago, in an Insurance Seminar, my friend from Kovilpatti, gave me a packet containing ‘kadalai mittai’ …. Seeing my startled look, he went on to explain, how special they were coming from his place ‘Kovilpatti’……… as you travel towards Tirunelveli, from Madurai, you pass through Virudunagar, Sattur, and Maniyachchi (the famous Vanichnathan martyrdom) – and in between – Sattur and Maniyachi lies Kovilpatti, famous for matchsticks, printing presses and firecrackers. Kovilpatti and its neighbouring towns are candy paradise and most shops sell eatables in shapes, sizes and colours that you may not have seen or eaten before. Ellu mittai, cocoa mittai, cheeni mittai, karupatti mittai and yeni padi mittai are some – perhaps undisputed King is ‘kadalai mittai’ - freshly made little chunks of peanuts held together by glistening syrup, topped with wisps of grated coconut dyed pink, green and yellow. It was through word of mouth that Kovilpatti’s kadalai mittai became famous, and the bus services added to the popularity, says some in the business. According to connoisseurs of edible items, “Kadalai mittai is made all over the State, but in Kovilpatti, the best ingredients go into making it”. The kadalai mittai usually takes the form of a slab of squares wedged together. In Kovilpatti, it is found as single rectangular chunks, or rather cuboids, sealed in packets. They are very very tasty, cheaper and so tempting … “Apart from the quality of ingredients, it has to do with the special jaggery used too’. The special jaggery is — “Theni vellam”, not the brown, hardened, round lump of jaggery. The groundnuts are sourced from the nearby towns, shelled, and then roasted in a machine. Going by this interesting report in Times of India of date, `Kovilpatti Kadalaimittai' (peanut candy) ¬ known for their crispy, flavourful taste would soon get identified specially with the place. People driving past often take a detour to buy kilograms of Kovilpatti peanut candy from Market Street. The 30-odd local manufacturers are now gearing up to apply for the Geographical Indication (GI) tag, seeking recognition for their product. According to a local manufacturer, “In fact we tried putting up some units outside Kovilpatti but we could not get the same taste. There is some magic in this soil and water as well as climatic conditions“, he says. “Our ancestors perfected the taste, we ensure there is no compromise on the ingredients,“ says another. Around 10 big players and 20 small players are in the kadalaimittai business here. Some 300 people work in these units earning Rs 200 to Rs 500 a day. Kovilpatti kadalaimittai's ingredients often came from the region. Groundnuts are sourced from Ottapidaram, Vilathikulam, Sathankulam & Kalugumalai in Tuticorin district. In the past, palm trees in Tiruchendur, Tuticorin, Srivaikundam and Udankudi produced palm jaggery that went into the syrup. “During village festivals, people used to make Kadalaimittai in their homes using groundnuts and palm jaggery easily available to them. The palmyrah bags they were stored in added to the taste and aroma,“ says a native of Kovilpatti. Today, sugarcane jaggery is used instead of palm jaggery . In the 1950s, Ponnambala Nadar cut the Kadalaimittai into slabs instead of the traditional balls and commercialized the business. From this humble beginning, Kovilpatti's Kadalaimittai is now gearing up for a GI tag. “We are ready with all the required documents including lab reports. We will soon be ready with the GI application. Everyone's working together,“ says Kannan representing the manufacturers. The kadalai mittai packets given by my friend left a lingering taste in the mouth and the gesture still remains in my heart….